High Efficiency Video Coding (HEVC), aka H.265 is a video compression standard designed to substantially improve coding efficiency when compared to its precedent, the Advanced Video Coding (AVC), or H.264. It is the natural successor to H.264, and is now started to become adopted as a mainstream product with vendors manufacturing h 265 hevc encoder products as oppose to h 264 video streaming products. HEVC the video compression standard ensures delivery of video quality identical, and in some cases with much more improved picture quality, as H.264 AVC, but an HEVC H.265 encoder offers double the data compression ratio, that is an improved efficiency of 50% over H.264. With an increasing growth of video streaming on the Internet over popular websites such as Netflix and YouTube, and with 4K cameras gaining new ground in the market, HEVC will be widely used in the near future. But not now. Majority of PCs, mobile devices, TVs, players and platforms work well with H264, while equivalent hardware or software for decoding HEVC (H265) is dramatically less common. So, to ensure a smooth H265 video playback on your smartphones or tablets or other devices, you’d better convert H265 to H264. After figuring out the truth that most devices, media players could’t support HEVC playback so far and H.264 still dominates the market. What we can do is to convert HEVC to H.264 for play on most devices. There are tons of H.265/HEVC Decoder and Encoder on the internet, but it is not easy to get a perfect one. Here I strongly recommend you Pavtube Video Converter | for Mac which is easy to use and grants you to transcode H.265 to H.264 on Windows or Mac with just three steps. 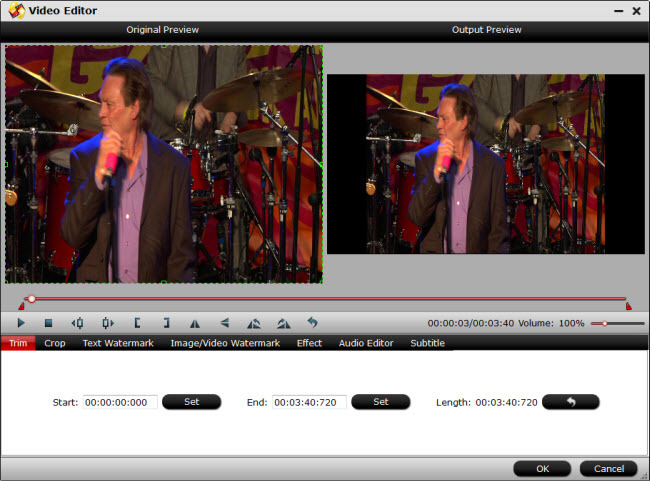 Furthermore, you also can make your H.265 more attractive by editing the video. If you’re confused with the length of the video, you can trim to cut video length; you also can adjust video brightness, saturation, contrast to add dominant tone in the video. For those people who want to insert the external subtitle to the video and make it easier to understand, you are in the right place, in the "Video Editor" window, you will be satisfied. Drag your files into this H.265 HEVC Video Converter, with "File"> ‘Add video’ you can load them with individual clips, or with ‘Add from folder’ you can import them with a complete folder. Batch conversion is also available. Go to the format bar to choose "HD Video">"H.264 HD Video"(*.mp4)". If you want to transcode H.264 to H.265, you can choose HD H.265 MP4 video or any other video formats. 1. If you want to convert your H.265/HEVC videos into common formats like MP4, AVI, MKV, FLV, M4V, etc, click here for detailed workflow. 2. Since this codec will compress into smaller file size while maintain the HD quality, the converting progress will take much longer than H.264 or other common codecs. 3. "H.264 HD Video(*.mp4)" option will output your files as H.264 high profile, which will reduce the quality H.265/HEVC degradation to the least. 4. Or if you want to keep the most quality of your videos, keep the original parameters in the "Settings" UI is also available. 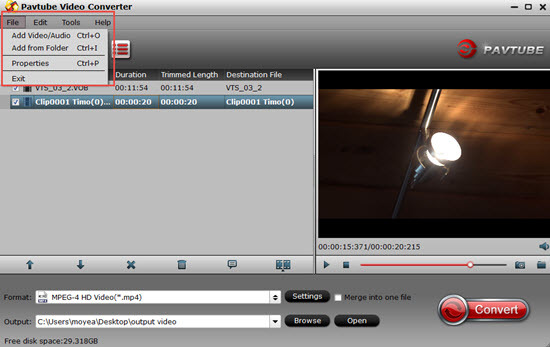 Click Browse to specify a destination folder to save the converted video file. Hit "Convert" button to start to convert HEVC/H.265 to H.264/AVC on Windows or Mac with this high-class H.265 converter at lightning speed. Even though H.265 is superior to H.264 based on demand, quality, size or compression rate, H.264 is much suitable for normal usage. By using Pavtube Video Converter to convert H.265 to H.264, you will have lots of options to watch videos and its time saving too. How to transcode H.264, XviD, MP4, MKV, AVI, FLV, XAVC to H.265 MP4?